Hello, fans of Mortal Kombat. We often draw characters from this universe. 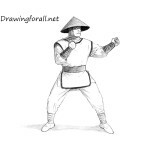 At our site you already have learned about how to draw Sub-Zero, Raiden, Goro, and many other characters. 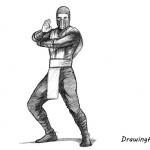 And now we learn to draw the champion of a tournament Mortal Kombat, the first mortal who defeated Shang Tsung – Kung Lao. Tutorial on how to draw Kung Lao we start as always – we choose pose of the character. In our example, Kung Lao is in a classic pose for him, but you can of course choose any other. We start with the head, draw it in a form of an oval. Then proceed to the neck, spine, arms and legs, which are drawn using simple lines. In the same step sketch out the lines of the face. 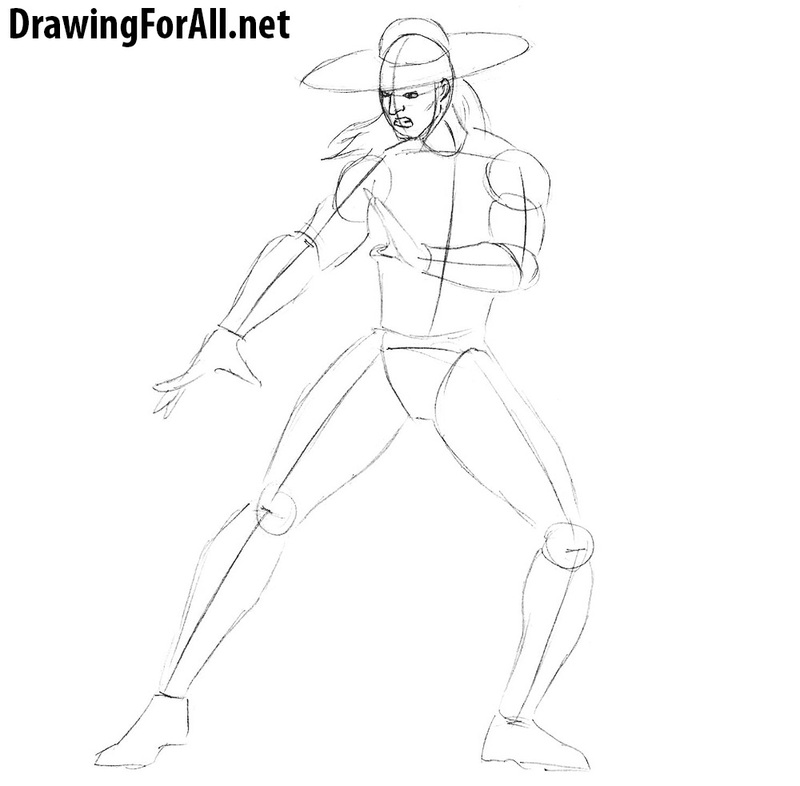 In the second step we add volume to the figure of Kung Lao. Start with the neck, in the shape of cylinder. Then draw a torso, which is narrowed in the area of the waist. Then proceed to the shoulders, draw it in the shape of circles. Next, draw the arms in the form of elongated and modified cylinders. 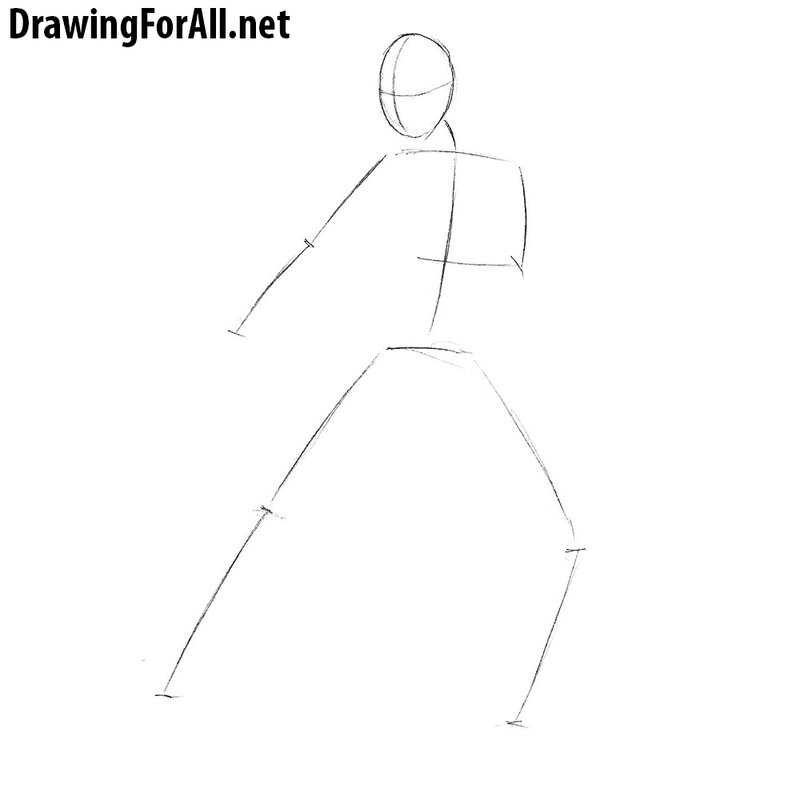 Then draw the pelvis and legs, that are drawn in the similar way as arms. We outline the hands and feet and move to the next step. 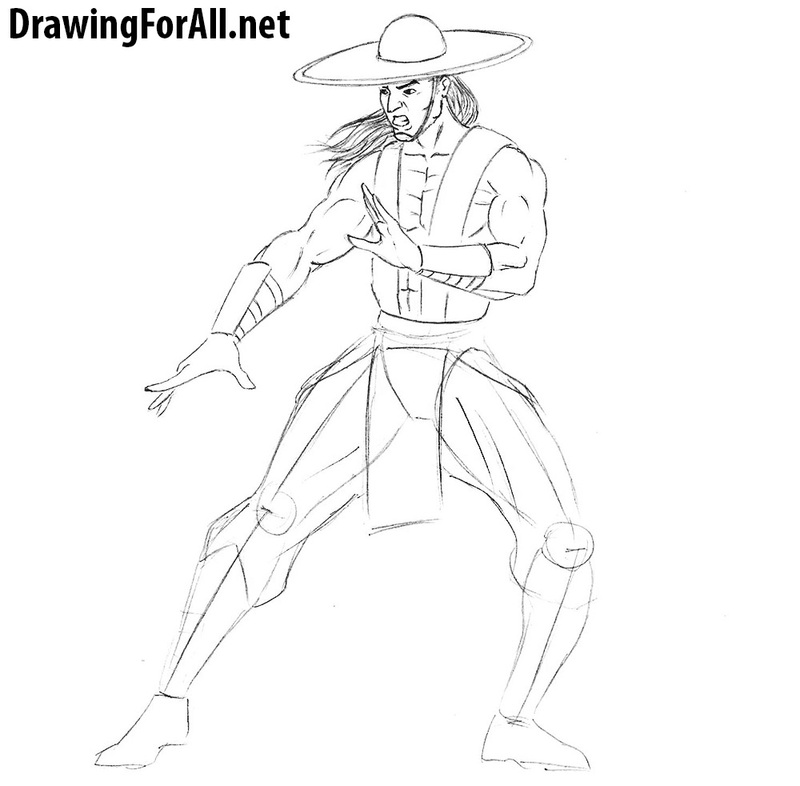 At this step we add a few elements on the head of Kung Lao. Let’s start with the famous pointed hat of our hero. First we draw the upper part in the form of a semicircle, then draw the brim of the hat. At the horizontal line draw the eyes. On the vertical line draw the nose, below the nose draw the mouth. We attach the lower part of the face a more natural shape. Sketch out the ears and hair. Here we finish drawing the head of Kung Lao. Erase the guidelines from the head. Draw out the lines of the hat and face. Carefully circle the lines of the eyes, nose, mouth, jaw. With long and curved lines draw hair. Draw the eyebrows and add a few wrinkles around the eyes and nose. Here we will add some details and elements of clothing. First draw two strips that pass through the shoulders and go to the belt. This item of clothing borrowed from the samurai. Then draw th*e bracers and belt. Draw the outlines of the wide pants, hanging items of clothing at the waist and shin protectors. 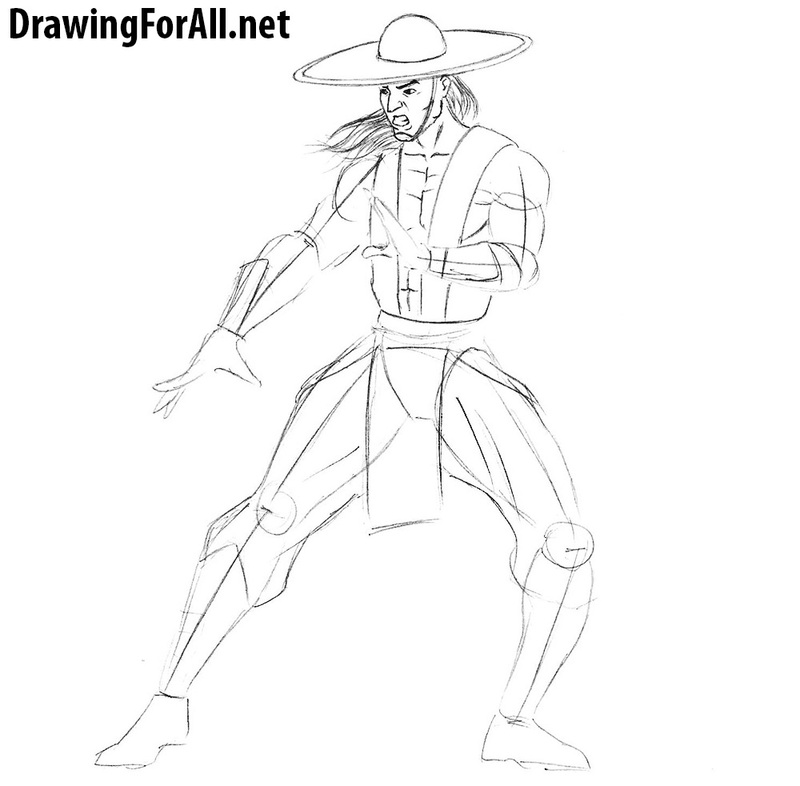 We are approaching to the home stretch of the lesson on how to draw Kung Lao from Mortal Kombat. Erase the guides from the torso. Circle the lines of the garment on the torso. Draw large pectorals under the garment. Draw lines on the pectorals and sketch out the abdominal muscles. We do the same actions but with arms. Draw out the lines of the muscles. Draw small lines of deltoids, biceps and forearms. Draw out the bracers. Very carefully draw the hands and fingers. By the way, if you notice, we draw Kung Lao from Mortal Kombat 3, but you can draw him from any other part, especially his image changed a little from part to part. And on the final step we draw the legs. As in the previous two steps erase the guides. Draw the belt. Draw out the lines of garment that are hanging below the belt. Draw the pants considering folds and curves of fabric. Next draw the shin protectors and feet. The lesson is over, and we hope it helped you learn to draw Kung Lao. Which character would you like to see on our website? Write your suggestions in the comments, and we will draw this character. And of course, share this drawing lesson and subscribe to our updates on social networks, so as not to miss anything important. In the near future we will do a lesson on how to draw Shao Kahn.